This is an “8-Bit LED 8-Bit Digital Tube 8-Bit Key TM1638”. It seemed to be a very good fit for my project since it not only had the display but it also had some buttons – something I needed too. In addition it had only three control lines which would simplify things a lot by sparing me from dealing with shift registers on my own – something I would have to do had I used the cheapest 7 segment LED display. When I got the board I got baffled a little bit. It was just a piece of hardware without any documentation. I deciphered the symbol on the chip and went for a quest to find some information about how it worked. I found a data sheet but it was mostly in Chinese. Unfortunately 我的中文不好, so I only skimmed it and continued looking. I quickly found that there is a library I could use. However I did want to learn how the thing I bought actually worked, so I spent some time more time looking for more information about the board. Finally, I found this page which turned out to be the most helpful and allowed me to start experimenting. As I already mentioned the board has just 3 control pins plus power and ground. The control pins are strobe, clock and data. The strobe and clock pins are only OUTPUT while the data pin can be both OUTPUT and INPUT. The strobe pin is used when sending data to the board – you set the strobe pin to LOW before you start sending data – one or more bytes – and then set the strobe pin back to HIGH. Note that there is just one data pin which means the data is being sent 1 bit at a time. This is where the clock pin comes into play. When sending data you set the clock pin to LOW then you set the data pin and set the clock pin back to HIGH to commit the bit value. You are probably already familiar with this pattern (if not take a look at this post) – it is the standard way of sending data with shift registers and therefore we can just use the standard shiftOut function to send 8 bits of data with just one line of code. To activate the board and set the display brightness we use the 1000abbb (0x8?) command where the bit marked as a is used to activate/deactivate the board and bits marked as bbb are used to set the brightness of the display. For example to activate the board and set the brightness of the display to the maximum value we need to send 0x8f. This function does not have any arguments. To write a byte at specific address we send the 010000100 (0x44) command followed by the address in the form of 1100aaaa (aaaa bits denote the location we want to write to) followed by the value. For example to write the value 0x45 at address 0x0a we would have to send the following sequence of bytes: 0x44 0xca 0x45. If we want to write values at consecutive addresses (very helpful to reset the board) we would send 01000000 (0x40) followed by the starting address (again in the form of 1100aaaa) followed by the values we want to write. For instance if we send 0x40 0xc0 0x00 0x01 0x02 0 would be written at address 0, 1 would be written at address 1 and 2 would be written at address 2. Note that we have 4 bits to select the address which means there are sixteen locations that can be written to. If you continue writing after reaching the address 0x0f it will wrap and you will start again from address 0x00. To read buttons we send the 010000010 (0x42) command, set the data pin as INPUT and read 4 bytes containing button status. Now we know we can write values to one of the 16 locations. This is the way we turn LEDs on and control the display. 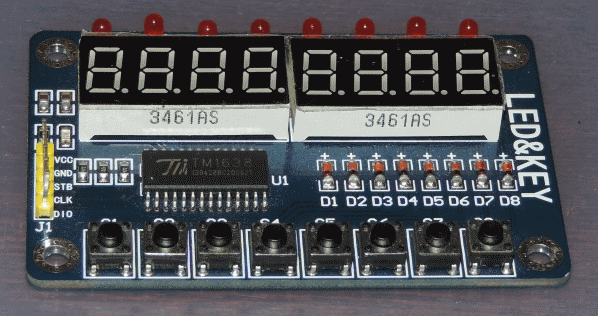 The board has two 4 digit 7 segment LEDs displays and 8 LEDs. Each of them has a dedicated address to which a value needs to be written to control the corresponding item. For instance if to turn on the first LED we would write 1 at address 0x01. Below is a list of locations with short explanations. You can find the entire sample in the repo on github. So, for instance if you wanted to display A you would have to write 0x77 at the corresponding location. Now we know how to control LEDs and the display. But there is one more thing the board offers – buttons. Reading what buttons are depressed works a little bit different from what we have seen so far. First we need to send the 0x42 command, then we set the data pin as an input pin. Finally we need to read 4 bytes from the board (bit by bit). The first byte contains status for buttons S1 (bit 1) and S5 (bit 4), the second byte contains status for buttons S2 (bit 2) and S6 (bit 5) and so on. If we | (i.e. logical `or`) all the bytes we will end up having a byte where each bit corresponds to one button – if a bit set to one means that the corresponding button is depressed. Here is a little program (I omitted the setup – it is identical as in the first sample) where the board will light an LED over a button that is pressed. Again, you can find the entire example in my github repo. The code for this demo is also on github. Very useful post. Thank you. Hi moozzyk, I have some troubles when implementing this with TivaC on Energia. As you may know the Energia library is designed for Arduino projects. I’ve implemented your full code on TM1638 successfully on Arduino but it didn’t work on Tiva C (LM4F123G). I compiled the code OK on Energia, upload it onto the chip OK, but nothing happens. I stroll again and again around the code and found nothing which I can edit to make it run. shiftOut is simple, the rest is also simple, but why it didn’t work? Could you try to implement this on Tiva C and Energia and give me some advice? Thanks for your comment. Unfortunately, I have not played with Energia/Tiva C yet and it does not seem like I will be able to get to it anytime soon. I can’t promise anything but you can post your code somewhere on github and I can take a quick look. For the complete sketch download the one of the demo, behind the video. I had problems with the snippets but later understood. I got this code working ‘as is’ with an ESP8266 too – thanks for the information. The specification sheet says the TM1638 requires 5V +/- 10%, but mine’s working fine on a 3.3V supply. When sending out values in auto increment mode, you have to write out the ‘missing’ green LED values – I did a shiftOut(data,clock,LSBFIRST,0) – that wasn’t immediately obvious to me. Thanks for pointing out incorrect binary values. I updated the post accordingly. You are correct – in auto increment mode you have to write the values for green LEDs even if your board does not support green LEDs. I guess this is the matter of addressing. A very useful and good post. I’ts not been too easy for me (not good C programmer) extract what I was looking for, but now I have more clear my mind on my board and your sketch. You wrote the essential to explore all the capability of the device TM1638: this is more than enough. But I have to add another positive note, because in your sketch, you haven’t used any library. On other side, many other post that I’ve found and try, calls heavy library, often more heavy of my entire sketch. So, instead of have the display handled by a small quantity of code, using the indicated library the memory amount for the display was bigger than my not short application. With your code all this don’t happens, and furthermore I’m now able to cut the unnecessary parts, reducing the code to 5898 bytes. This it’s been for me a one day school lesson. Thanks a lot for your comment. I am glad you found the post useful! Just a note: in the post there are some broken link. (delete this reply when you want). Thanks for reporting – it’s been a while since I published this post. I will check the links. moozzyk, thank you for this information. You allowed me to develop code for my favorite processor to use these displays. I understand that this article is 3 or 4 years old now. I’m not sure about your code, but the description above is not correct for the boards that I have recently purchased. I know sometimes we don’t get back to correcting the documentation. I have found that the 4 bytes returned for the switch status all have the status in “bit1” and “bit5” assuming “bit1” is the LSB. So, the description should be: S1-bit1, S5-bit5; S2-bit1, S6-bit5 and so on. I can’t exactly tell with your code, but to combine all the switch status bits into one status byte by ORing bytes with my code I have to shift the second, third, and fourth byte before the ORing to put them in the correct position. Thanks for all your work on these projects! I still have lots to look at. Looking at the code I think you might be right. In this line `uint8_t v = shiftIn(data, clock, LSBFIRST) << i;` the `<< i` is shifting the value after reading the byte so that it can later be OR'ed with already read values using '|'. If it was not like you say shifting would not be required. Thanks for pointing that out! very special thanks for the explanations and all the detailed instructions. I was searching for a useful Arduino UI/HMI for further projects and found the LED&KEY. J was reading the datasheet and then your instructions, and 60s after unboxing this unknown piece of hardware I was able to control several LED and digits on the shield. Of course today there are well known developed libraries for this chip. But for understanding how it works it is very interesting to use your plain text examples. Thank you soo much , i makes a lot of fun to read this and helps a lot. FWIW there is a very good menu library available for the TM1638 at http://forum.arduino.cc/index.php?topic=351186.0. It provides functions, that with minimal coding, will allow you to used the buttons and display as an interface to your project. Shameless plug (because you seem to be the author of the library…) I think you know that this article was written before you wrote your library. The idea behind this article was to understand the board and write kind of documentation that describes it because, at least at that time I wrote it, there was pretty much nothing available in English. Understanding how things really work is completely different than using a library and a lot of people really appreciate that they could learn all the details. Want to know whether Led&Key shield can be used on IOT2040. I tried it but unfortunately not working, though iot2040 is an arduino compatible. Appreciate if I can get some support on the interface. I have not played with IOT2040 so don’t really know. I would think that if it is Arduino compatible then it should work. great instructions written in plain English, thank you. how I could adapt that code for the TM1618, I tried but the segments light up wildly, do not form the pattern they should form, any advice? Unfortunately, I have not played with TM1618 and don’t know what the differences are so I can’t help here. Sorry! This is a good idea and is the best way to study, going to the deep of the argument and producing a report to be shared with other people. I picked up the LED&KEY board as a cheap display for a costume I built. Your excellent program has allowed me to quickly setup multiple text scrolls without too much programming. I do have one question, since my Arduino skill are still very basic. Is there a way to have the program loop through just the counting and text scroll phase? I just need it to count, display a bunch of scrolling text, pause, then repeat. I believe you have some mechanism in there that stops the program from looping from the beginning but I can’t figure it out. Apologies as this may be a really dumb question. If you don’t want the buttons part you can just add the following line just after the switch block `mode = mode % 1;`. This should result in disabling the buttons mode and the program will be switching the first two modes continuously. Perfect! Thank you. I’ll have to read up on the mode command to understand how it controls the looping. Sorry, I have another question. I tried to add the line ‘mode = mode % 1;` in several different areas of the code and kept getting an error. Can you tell me the line number where I should insert it, so I can be sure it’s the right block. There are many switches, blocks and modes, and I’m a bit confused. Thanks. Only I just noticed a mistake – it should be `mode = mode % 2;` or `mode = mode & 1;` (either should work). Not sure what error you got so hard to tell what did not work. Also there is only one `switch` block in the program. Is there a way to completely eliminate the switching part of this code, so the counting and text scroll modes run as one big loop? That way I can add additional code above and below the sections you created. I understand the basic functions but the switching program you created has me very confused. I love the way your script runs without the need for a library, but the switching part is beyond my skills. The program is just a demo so runs sequentially modes until it reaches the last one (buttons) which will be active for the rest of the time. Modes are numbered 0 (counting), 1 (scrolling), 2 (buttons). Modes 0 (counting) and 1 (switching) indicate completion by returning a boolean flag. Mode 2 is terminal so does not return any status because it never completes. The boolean values returned by modes 0 and 1 are implicitly converted to an integer value (false translates to 0, true translates to 1). This is why I add the return value to the mode variable. Note that by returning false (i.e. mode not completed) I just add 0 to the mode variable so nothing changes and the next time the switch block is entered the same mode is used. Two notes – the mode variable is static meaning it will be initialized only once and even if the function is entered later the variable won’t be re-initiailized (it could be changed to be a global value and the effect would be practically the same). The loop function is called continuously by Arduino. You can definitely remove the switch block – e.g. you can remove the switch and the mode variable etc. altogether and just invoke buttons() from the loop(). The buttons() function is I think the closest to real life since it is handling buttons and scrolling the text at the same time. I’ve had more time to play with your code, and I’m really enjoying the way it’s structured. One question, if you don’t mind. I can see the counting() function returns after the “position” variable is greater than 8 (since it counts 0-9), but how does the scroll() function terminate and return? I know it has a FOR loop using a variable called “i”, but the logic really confuses me. I’ve added more lines of scrolling text and for some reason my code scrolls all the text one and a half times before it returns. Not sure what causes the loop to restart instead or return. I’ve also tried to remove the whole 3 switch function, but ran into more confusion. There is only one delay statement in the program, so I know each line from the subprograms loops back through the main loop (otherwise you would have to add delays within the FOR loops). It’s the way the programs return to the main loop that is giving me issues. scroll() has the index variable that is tracking the progress of displaying the scroll. Once the index is twice the length the text to scroll scrolling will terminate. This is the line does that that: `index = ++index % (scrollLength << 1);`. scrollLength << 1 is an equivalent of scrollLength * 2. Because of the % operator once the index reaches scrollLength * 2 the expression will evaluate to 0 which will results in returning true from the scroll() function (return index == 0;) which in turn tells the logic in the loop method to move to the next mode. Dear Mujik, thanks a lot for your post ! I am sorry but I don’t know why it is connected like this. My opinion (maybe wrong) is that if we use a standard BCD counter and 7 segment decoder/driver, we also are forced to apply Seg1 to A, Seg2 to B, Seg3 to C, and so on…. But if we drive an array of segment /seven + DP) with a device as TMS1628, we are free to chose the pin to associate to every segment. This is because we work with a pattern that contains the High or Low in the bit-position that we prefer. Connect 1 to A, 2 to b and so on, we can anyway display on our seven segment digits meaningless character. We have to remember that with 8 bit we could show on every digit 255 pattern + a blank, but only 10 of these symbols are number. I think that in your circuit, the PCB maker ask to the engineer to change some track, to have a simplest routing work. This need to change the association bit-segment. What you mind about my hypothesis?